When implemented correctly, the B.E.S.T. strategy can produce profits if the stock moves up, down, or doesn't move at all. The basic concept is straightforward, but like many things, the devil is in the details. The presentation will include everything you need to know to implement the B.E.S.T. strategy including some current examples. Stan will also answer any questions you may have regarding the strategy. Learn directly from one of the most revered experts in the field of options without leaving your house or office with Larry McMillan's Webinars. Each webinar runs at least an hour in length and features an extensive Q&A session at the end. 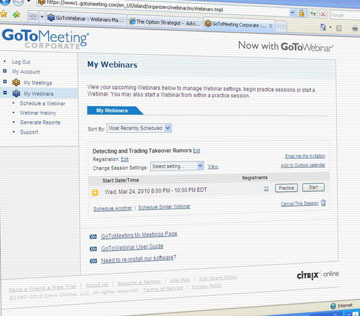 Recorded webinars can be downloaded directly to your computer for limitless viewing.